Nehemiah had been recounting the works of the Lord both in creation and in His commitment to the Israelites after He had brought them out of Egypt. Notwithstanding their faithlessness, idolatry, complaints and desire at times to go back, God remained faithful to them. He did not desert or forsake them but continued to guide, protect and provide for them. And in due course He brought them into the Promised Land. They could have entered into it a lot earlier if they had trusted Him – but even in His anger He did not abandon them. Now with God’s help Nehemiah was rebuilding the walls of Jerusalem which had been broken down when the people were taken into exile because of their disobedience. God was preparing to bring them back again. 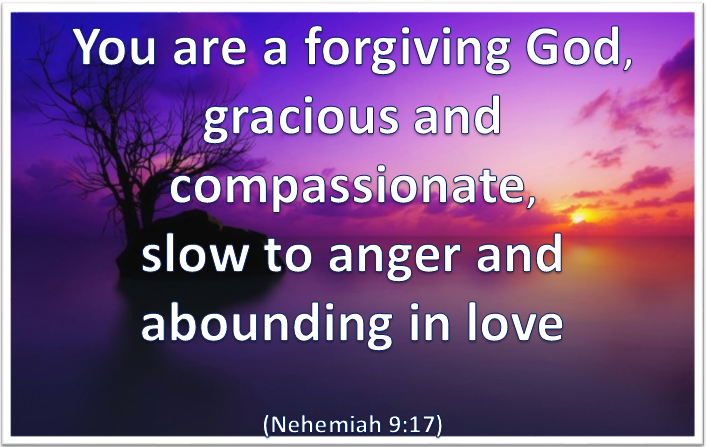 These wonderful qualities of our God, expressed by Nehemiah, are so clearly revealed in His relationship with His people over the ages. In their faithfulness when He could bless them and in their faithlessness when He disciplined them He remained with them and true to them. Wherever we are in our journey of life God is with us. Sometimes we keep Him at a distance, at others we forget all about to Him – and then there are moments when we cry out to Him with real urgency. However we treat Him, He is always ‘here’ – He will never desert us. Lord please help me to believe that You are with me, and to entrust You with my life and daily living. Amen.